View fron Nightcliff Swimming Pool towards Casuarina Beach at low tide. 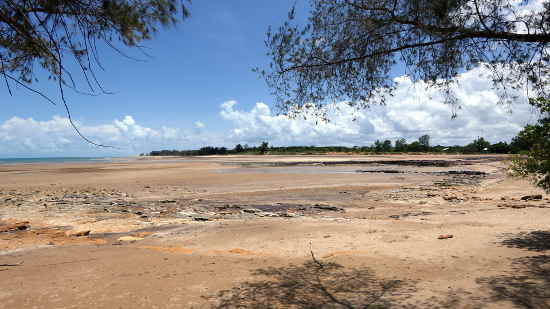 As seen in the photo above, low tide exposes rocks and reefs sitting in wide expanses of sand (and sometimes mud). At high tide the rocks in the foreground are covered with water, the results of tidal changes of up to 8 metres. The view on the right is taken from about the same spot with a slightly different angle to show the sandstone cliffs that give Nightcliff its name. 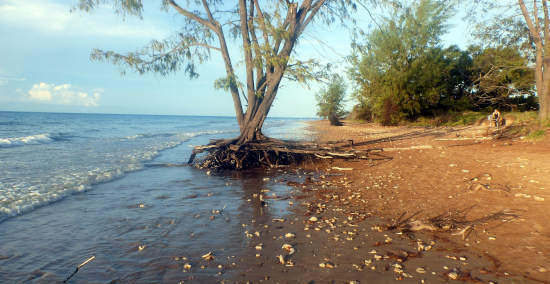 An incoming tide at Casuarina Beach brings driftwood and cuts channels in the sand as it heads towards the cliffs. 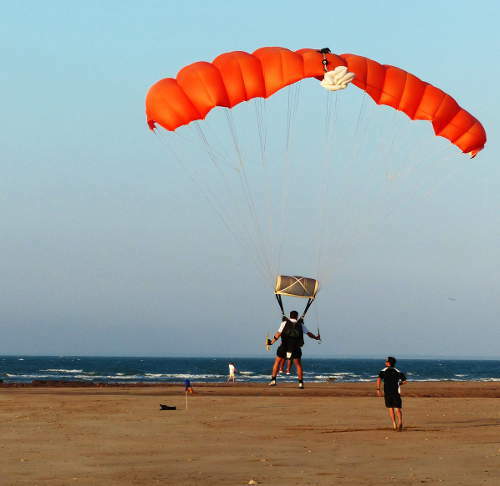 Located on the doorstep of the northern suburbs, this beach has a well developed playground and BBQ area just off the sand and is the home of the Darwin Surf Lifesavers Club. Same view on an incoming high tide. 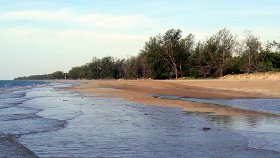 Incoming tide at Casuarina Beach. A five minute stroll from the City Mall, this man made beach has it all, with icecream and coffee shops and the wave pool next door. The City Beach is part of the new Wharf Precinct, transforming mud flats and industrial sheds into a convenient playground for the CBD. Sun, sea, sand and shade in a grassy park. Waiting for the sunset on Mindil Beach. Mindil Beach on a Thursday or Sunday evening is crowded with people waiting for the sunset. During the dry season the Mindil Beach Markets, under the trees behind the sand dune, draws locals and tourists alike with a variety of crafts and bargains and the aroma of freshly cooked food. 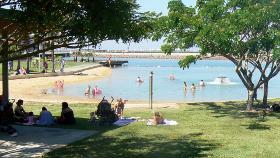 Fannie Bay Beach is a popular beach close to the city with playgrounds, BBq's and a great view. There is usually a wide strip of clean sand, unlike the photo (right) which was taken during an unusually high tide. 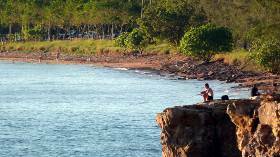 Darwin beaches are not the same as you will find around most of southern and western Australia. Due to the local geography anything close to good surfing waves are scarce and because of box jellyfish and crocodiles, extreme caution must be exercised in or near the water. 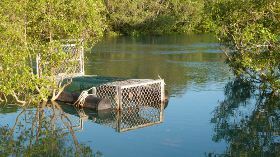 Generally the dry season months ( May to August) are safe from jellyfish, and the Darwin beaches and creeks are all protected by rangers and crocodile traps. Dog and horse exercise areas. 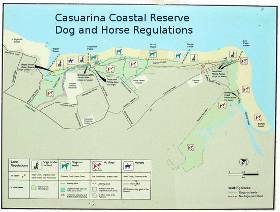 The good news is that there are areas available to take your dog for a run, or even ride your horse along the beach. Check the Government Information boards for the exact regulations. 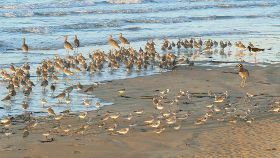 As well as people, flatback turtles, migrating birds and other wildlife use these beaches, so it is important to be careful. As you can see on the map, this beach runs all the way from Rapid Creek around Lee point to Buffalo Creek and on any low or medium tide you can walk the whole length. As you walk north east along the beach you cross a small tidal creek and then a hundred metres or so futher on there is a 500m length of beach where clothes are optional - the free beach. Past the nudist beach area there is another larger creek called Sandy Creek which can also be crossed at low tides and then another long wide beach running all the way to Lee Point. Lee Point is a well developed picnic and recreation area with car parks, seating and toilet blocks. 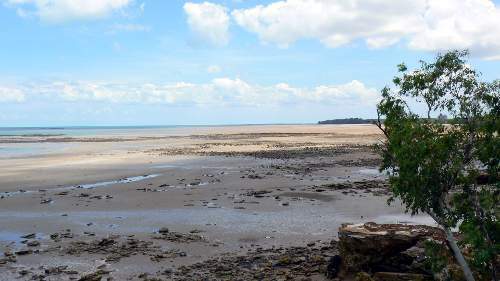 It can also be reached by driving out from Darwin along Lee Point Road. Rapid Creek at high tide. 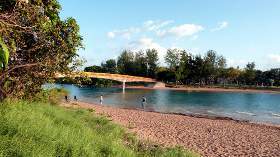 Walking in the opposite direction - towards the south-west - will eventually bring you to the very end of Casuarina Beach at Rapid Creek. At low tide this tidal creek is little more than a trickle of water running through wide expanses of sand (see photo at top of page) and can be crossed easily on foot. 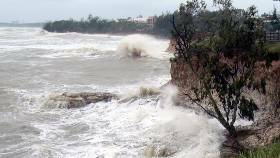 Once you cross you are on the Nightcliff headland with a stretch of small beaches locked in between red sandstone cliffs. 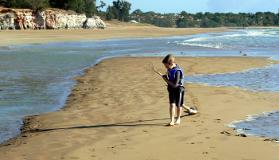 Casuarina Coastal Reserve begins at Rapid Creek and covers several beaches along the coast as far as Buffalo Creek. Access at different locations is provided via Trower Road, Lee Point Road and Buffalo Creek Road. It is possible to walk the length of the reserve when the tide is low enough but Sandy Creek can only be crossed at very low tides.